Searching for assets is the core functionality of a DAM system. 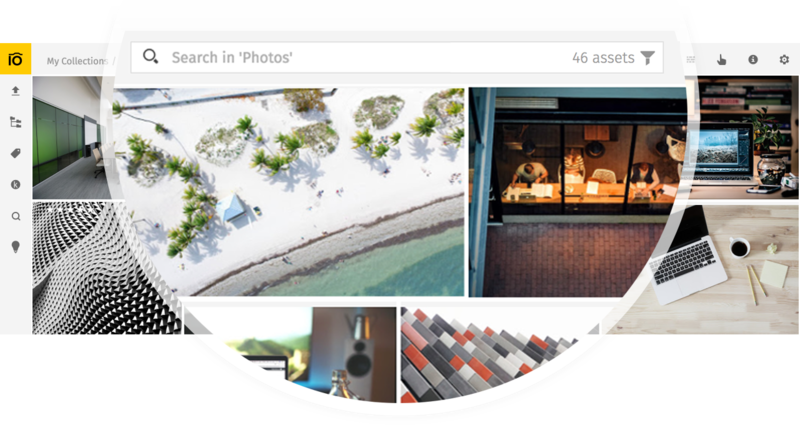 Therefore, Pics.io has gone to a great length to provide you with a powerful search engine with versatile capabilities of broad and advanced search. Let’s start with the basic broad search in Pics.io. The Search field is located on the top panel in the very middle of the page. If you want to limit your search to a specific collection, select this collection first. If no collection is selected, the system will search in all collections in your digital library. By default, as you type in your search query, Pics.io will offer you a number of probable keywords that you can choose if you want to. If you don't choose a keyword and simply type in any word in your search query, the system will perform a broad search and retrieve miscellaneous results. For example, you may write the word book in your search query, and the system may find assets titled as facebook, e-book, booking, etc. Read on to learn how to make your search more specific. After the search operation is completed, you will see a figure in the Search box. This figure indicates how many assets have been found in your digital repository that meet your search criteria. Can I make my search more specific? Sure. To make your search more specific, click on the funnel icon in the right corner of the Search window. Here you can configure different criteria for your search. Under the “Search in” field you can filter your search by checking the necessary boxes. All boxes are checked by default. Please note that at least one of these boxes has to be checked to start search. All fields By checking this box you automatically select all the fields, so your assets will be searched by all the criteria that follow. Content You can search for assets by their content. Type your query in the search window, and Pics.io will retrieve files that contain your query. This function is only available for PDF and AI files so far. Filename This is the name of the asset the way it was uploaded in Pics.io or synced from Google Drive. Title This field can be added in Pics.io manually or by means of parsing the existing metadata from the asset. By adding a title you can provide more data on the asset, which will eventually make it easier to find. Description This is additional information that can be added manually or by means of parsing the existing metadata from the asset. Keywords By checking this box you can search for your assets by typing a keyword. Keywords can be added in Pics.io or parsed from the existing data when the asset is uploaded. If you have a hierarchical list of keywords and type in a top keyword in your search query (e.g. "animals"), the system will also find assets with attached sub-keywords (e.g. "elephant", "zebra", etc.). However, this function doesn’t work vice versa. Custom fields If you check this fox, your search will be narrowed down to the information in the custom fields of the asset. Collection name Checking this box you will filter your search by the name of the collection your assets are located. How to limit search to assets that exactly match your query? If you simply simply type in a word in your search query, the system will perform a broad search and retrieve miscellaneous results. For example, you may write the word book in your search query, and the system may find assets titled as facebook, e-book, booking, etc. If you want to find assets that exactly match your search query, you should put quotation marks before and after this word: "book". What if my search query consists of more than one word? Sometimes, you have a search query that consists of more than one word. For example, you have a keyword red rose, and you want to find all your assets with this particular keyword and avoid other assets with keywords red or rose used separately. To do so, put quotation marks before and after your query - e.g. “red rose”. In this way, you will retrieve files that exactly match your search query. Pics.io fails to find my asset. What shall I do? In many cases it happens because the word you’ve typed is only part of the original filename, not the exact filename. Try putting asterisks before and after your query (e.g. *filename*). For example, you are trying to find an asset with a title which you think must be waterfall. However, the system doesn't retrieve anything to your dismay. Try typing *waterfall*, adding asterisks at the beginning and at the end of the word. There's a great chance that Pics.io will find an asset with the title waterfalls, or something similar, where waterfall was only part of the whole word. The same applies to titles, collection names, etc. You can read more about asterisks and other wildcards here. Is there a possibility to narrow down my search even further? Type You can search for specific types of assets, e.g. videos, text documents, sketch files, etc. 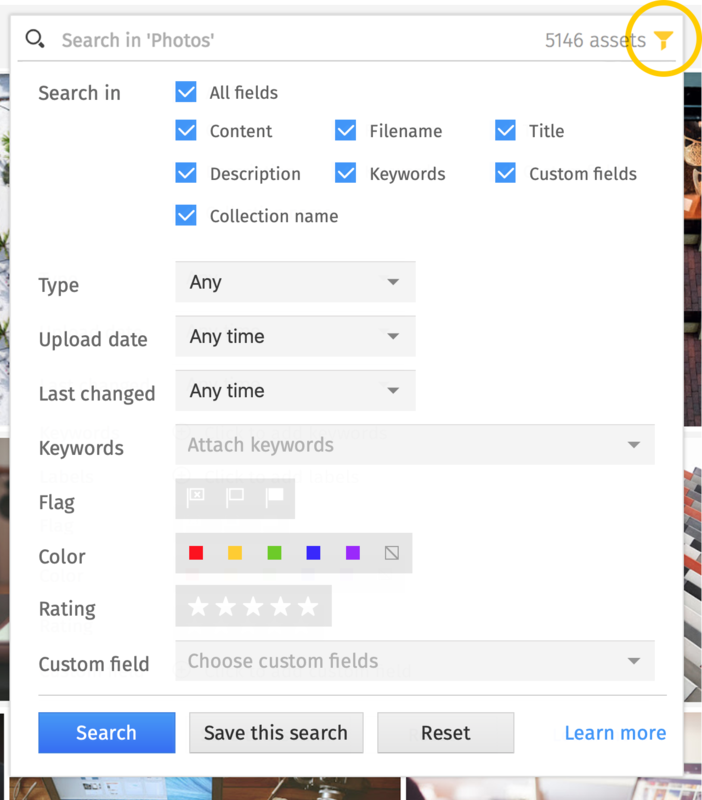 Upload date You can narrow down your search to assets by specifying the time when they were uploaded to Pics.io. Keywords Here you can select certain keywords from the list of your existing keywords that are attached to your assets. Flag, color, rating You can narrow down your search by specifying the flag status, color label or star rating assigned to the assets you want to retrieve. Custom fields Here you can specify the information which is saved in the custom fields of the assets you want to find. For instance, you can specify Camera Type, Artist, ISO, etc. These metadata are either parsed from your assets as they are uploaded or entered manually in Pics.io. Once you set your search filters, hit Search. The funnel icon in the right side of the search window becomes bright yellow. It’s a reminder for you that a search filter is now on, so you can only see those assets that fit the selected criteria. To stop search and close the search menu, press Reset. You can save your search results so that you can have immediate access to them later. Read about Saved Searches here.